I love reading books by Joo Cheol Kim, Chief Pastor of the World Mission Society Church of God, and realizing that the statements he uses against other churches also apply to his own. I’m surprised that WMSCOG members can read these contradictions and still remain a member of the organization. If you’re a current member, I would appreciate hearing your comments in the comment section at the bottom of this article. Joo Cheol Kim Says The True Church Has Few Members? That’s right, Mr. Kim just said that. 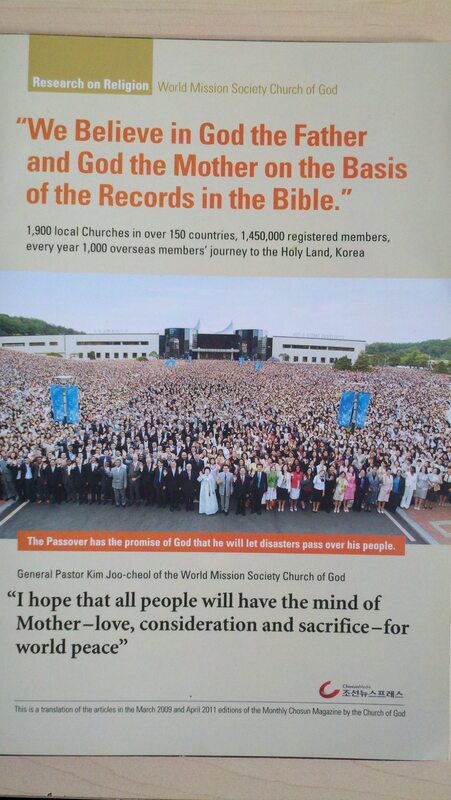 Read that again in case you missed it because at “1,450,000 registered members” it would seem that according to Joo Cheol Kim’s own words, the WMSCOG is too large to be the true Church. Joo Cheol Kim Says False Churches Are “Gorgeous”? Are The WMSCOG Buildings Not Gorgeous? I’d say many WMSCOG buildings are quite “gorgeous”, wouldn’t you? The WMSCOG has also established many churches around the world according to their church history outlined here. They also show off images of Joo Choel Kim receiving recognition from the UN and ZhangGilJah receiving public awards in South Korea. Does that not qualify the WMSCOG as “famous in the world”? How can the WMSCOG hope to save the world if no one knows about them? Wait a minute. Joo Cheol Kim says that the fate of churches with “large and luxurious buildings” is the “judgement of hell”? 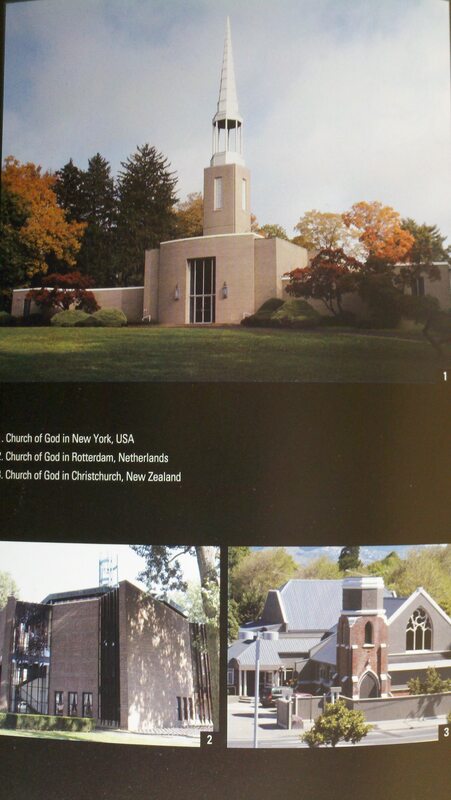 What about all of the WMSCOG’s large and luxurious churches like the one he just described, the ones pictured on their official site here, or their headquarters pictured here? (Pretty large and luxurious looking I might add). According to Joo Cheol Kim, wouldn’t the WMSCOG churches suffer the same fate as all of the other “large and luxurious” churches? Is that not a double standard? The fact is, it can’t be reconciled; it’s a contradiction. If this was any other church, one could chalk it up to an error in preaching. However, we have to keep in mind that the WMSCOG claims to be led by “god in the flesh”, aka the “heavenly mother” Zhang Gil Jah. How can a church, who supposedly has “god in the flesh” leading the organization, allow Joo Cheol Kim to write these errors in their official publications? Why would the “mother god” allow such errors to be made? I can not help but notice a glaring contradiction after reading the above referenced material and reflecting back on when I was a member. I remember the pastor and various other high ranking members saying that “the Bible can not contradict itself”. While I agree with this statement, I can not ignore the WMSCOG’s assertion to be the only organization that interprets Scripture correctly, claiming that people who do not agree with their interpretations are “using their own minds”, and yet they make statements that are in complete opposition to themselves. So the Bible, being God’s inspired word, can not contradict itself, but the WMSCOG, an organization claiming to be led by “god”, can? If you’re a current member, I would appreciate reading your thoughts on the above points in the comment section below. I think it wrong to bash one church. I think that every religion is a cult. What’s your problem with church of God when its not really different from other church’s. So what if he says something in contradiction, all pastors do that a lot. I’ve studied different religions and have interviewed people about why they think their church is the right church and they bash other churches like the Christians are fake and Buddhist are miss led Ect. Why must you carry on a website about one church. Excuse my French but I think you need to f*** off. If people want to go and of that’s what makes then happy let them be. I don’t even go to this church and I’m annoyed by you. The profanity in your post has been moderated. Your comment has been moved to the forum here. Feel free to respond but please refrain from using foul language or your comments will be removed. Hi Carmen. Thank you for your post. I also agree that it is wrong to bash one church. However, I am confused. You said they are really not different from other churches. I have researched this church for over three years. I have been there several times, as has my husband, son, and daughter. I am very familiar with their doctrine, and one thing they make very clear is that they ARE COMPLETELY DIFFERENT THAN OTHER CHURCHES. That is why they tell members they cannot go to any other church and be saved. If they were all the same, they would not say that would they? They tell members they cannot even step foot into another church, even for a funeral of a relative, or any other reason. Also, if it is wrong to bash other churches, there is a strong contradiction in their actions. I saw for myself that they have a constantly running video in their cafeteria area about how the Catholic church is evil, and the Pope is evil, etc. I am not Catholic, but this video was disturbing, and evidence that they do bash other churches. From what I have personally witnessed, from what I have researched, and from what I hear from members and former members, I know that this is not a real Christian church. Please research it thoroughly. And then run from this group. Carmen, please reply. As I said, we do have common ground, such as your comment that people should not bash other churches. What is your reply to my comment? I am willing to listen. I do not think all the people in the wmscog are bad people. I know there are good people in there. What do you think? I am listening. Hello Carmen,I am a member of the church of God and I believe your site is… [comment moved by admin to the forum for further discussion. The WMSCOG has broken up many families, led people to poverty, brainwashed children, blinded people into following them, misled believers, sued people who disagreed with them (yes, you read that right. They sue people who disagree/say anything bad to them), and worse, they doctored the bible, history, claimed outsiders evil, and even changed their leader’s history (in reality, their so-called leader is against their ideas.). And it’s still happening today. It is the site owner’s job to expose them and their lies so people will finally escape. I was one of the luckiest ones to not spend much time in the cult (3 months to be exact), but I tell you that escaping this cult is a long, psychological, painful process and I’m still recovering from my trauma. Call me stupid all you want for being a believer, but some people are just f****** a*******. I went to this church for about a month and it messed with head. My now ex boyfriend is still a member.. They even made me feel guilty for working at a special needs school funded by Catholics.. They try to tare you from you family and loved ones.. Your job etc… I dont think it is ok to bash a church but I think ppl are just angry from the harm this church is causing… Church isn’t suppose to make you feel this scared and awful..
A real church DOESN’t make you feel scared and awful. A harmful one DOES. It is unfortunate they are so manipulative, but how else could they get anyone to join? Anonymous & Carmen —- Ive been going to this church for about 6months now, and I really believed I found God .. The way they teach you the bible is so amazing , fun and you believe with all your heart its true,,, But in all reality it’s not! True god almighty dont dwell there , but the devil him self …. That pastor, [name removed by admin] is Satan in the flesh and I dont care what any one else think…. He is totally the opposite of what he preaches…. He is pure evil… First he try’s to scare the skin off of you, then say “if you do what i say then you will be my sister/brother and i will be your brother , if not your Satan” What kind of holy man speaks like this…… The fact that this website is up is a good idea. people need to know the truth about this fake church. This church gives you false hopes and dreams. And all they do is take take, take , your hard earned money.. For there queen in Korea… This CULT can destroy your life,I almost gave up everything because I wanted to serve “GOD” and I would of too, if my friend and websites didn’t wake me up from this spell…. I feel so hopeless inside and confuse…. Who can I trust? Since his real name is not [removed by admin] it’s a aka, lets call him pastor [removed by admin]. I used to be mad as hell about him kicking people out of the church and the way he would screw with people in order to make them leave on their own. Trust me now, it’s a blessing. I hope he makes everyone angry so they all quit. Don’t feel hopeless or confused. Did not God open your eyes and get you out of there? Trust in God, He is still looking over you. In the sermon, ” What shall we give to god?” a young brother is stealing two eggs a day from the family. His reason for doing it is to buy new shoes for his mother. This story is designed to tug on your heart strings. Upon further thought and holding it up to the Word of God is this not still stealing? WMSCOG still believes that stealing is a sin don’t they? This son keeps his activities a secret even though his family is trying to find out why eggs are missing. Isn’t that a form of lieing? In the end he presents his mother with the shoes, finally comes clean about what he’s been doing, and everything is alright. What? Again I say What? This kid lies and steals and it’s alright? Where is the needed correction? It seems that the WMSCOG believes that the ends justify the means. Is this what they call a righteous lie? This must mean they believe that lies are ok as long as the end product is good. Judging from this sermon, everyone can expect to be lied to by this group if they feel that they can influence you into their idea of good. As for me and my house we will serve the Lord Jesus and that includes not lieing and asking for forgiveness and accepting correction if we do. I am glad to know this web-site and thank for admin. This will help people to know who WMSCOG are. Except this, there are numerous evidence about them and many things among them have not been clarified yet. AnSangHong described himself as a “prophet” not “jejus” in his writting. After his death, some of his followers called him “last comming jesus”. Even we know that AnSangHong already denied God-mother in his writting. I’m someone who’s currently trying to decide one way or the other about this church. I was actually just glancing through that same collection article which I got a week or two ago. As for the comment on ” fate of those who had large and luxurious buildings,” maybe he was commenting on those who made them because the magazine does seem to boast in several places on how they preserve abandoned church buildings especially on the second page. “The architectural styles of the Church of God are diverse. It is because they take over the buildings of churches that have lost their congregation throughout the world, and use them for their worship places.” However I must admit that I found the main/head church to be too oddly gorgeous. I thought to myself that maybe they bought it as is. But then they showed me in the film the artificial waterfall built somewhere near it I think and I thought to myself what a waste of money. As for the church size being large comment, the estimated world population is 7 billion. When you compare 1.45 million to that, that’s only 0.021% of the world’s population. However I’ll admit ignorance as to the relative size of large churches other than the catholic one, which I’d throw out as using that as any basis for determining a large or small church…after looking it up it would seem they’d be in top 100 or close to it. He must be going on a world scale or something. Here’s a thought. In the end times there will be a great falling away of the things of God. This church proudly boasts that their church is growing while every other church is losing members. By their own admission they are not a church which has the favor of God. Maybe when he says the small church he means the Church of God’s Members against all conventional churches and catholic churches on a global scale? If that were true then any church with less members than the WMSCOG, is the true church. Joo Cheol Kim’s entire reasoning is flawed. He didn’t say the “smallest” church he said the church with a “small number”. So comparing the wmscog members vs the christians of the world then the wmscog is considered a small number. Therefore not the smallest church is the true church. Just a church with a “small number”. how many members does the WMS claim to have? Aren’t you the expert? I don’t know why not you tell me? i’m currently attending the church of God. i thank you for coming up with this blog. because of this, i realized, there are people who were concerned about me. had the time to read all your articles… just for me. i have encountered this people you were talking about (not the real one’s, just same attitude). people with same religion doesn’t mean they have the same personalities, don’t generalize. that’s what i realized after reading some. when people see a different person, they are curious right. they ask. they look for answers. its normal. when you clothe yourself with some daring and a conservative look at you with contempt, they will smirk and instantly hate you. its normal. because you are both OPPOSITE. its all normal because we live on this earth. we live by the rules PEOPLE set up for this world. but did you ever thought about the law God set up for this world? so that we will live bound by His rule? it’s one of the Good thing i’ve learned in the church of God. to atleast follow God’s will and command. the sabbath day is one of the things i’ve learned. sabbath day is saturday (you can search in your own). it is the 4th commandment. the reason why people worship God on Sunday is because Jesus’s rose on that day. but then, it is not sanctified in the bible. if we set aside the sabbath day and worship sunday, why don’t we just disregard the 10 commandments. so we can live on OUR OWN, bound by our OWN rules. but all in all, i understand your blog but then i have to like it, right? there was a wrong typo. it should be “i don’t have to like it” anyway, right now, i have learned many things in the church of God. if you believe in Jesus Christ, can’t you atleast do the 10 commandments? have you asked yourself, if you had one thing accomplished among the 10? if you had, keep it up and it doesn’t hurt to do it all, besides, what is the LAW of PEOPLE compared to the LAW of GOD? Again, thank you for commenting. The issue of whether or not believers in Jesus Christ are bound to the Old Testament Law has been debated again and again over the years, but it should not be debated at the bottom of this article because readers may have difficulty following the discussion, and the issue is not directly related to the subject of the article. Feel free to post your question in the forum. You have every right to disagree. But I am concerned that since you are a new member, you many not be fully aware of all of the inner workings of your church. I suggest that you join the forum and discuss your thoughts and opinions with other members and former members. I am glad that you are reading information that is critical to your church. That way you can make sure that you are making an informed decision about whether or not you remain a member. Hi Phil, it’s a strange coincidence that you would post about this now. In the forum there is a brand new posting that talks a little bit about your group. Check out: “There’s hope for the WMSCOG but will they realize it?” Glad you’re here, this could be really good.